Salsola tragus skeletons on sand dune at Petrified Forest National Park, Arizona. Cover design by Patricia Guertin, Southwest Biological Science Center. An important aspect of management of invasive, non-native plants (invasive plants) is information on the type, location, and magnitude of infestations. Regional development of this information requires an integrated program of data collection, management, and delivery. The Southwest Exotic Plant Mapping Program (SWEMP), coordinated through the U.S. Geological Survey’s Southwest Biological Science Center, annually compiles occurrence records for infestations of invasive plants. Operating since 1998, the SWEMP team has accepted occurrence records contributed voluntarily by federal, tribal, state, and private collaborators and has compiled these contributions accumulatively with previous versions of SWEMP. The SWEMP 2007 regional database update, SWEMP07, contains 62,000 records for 221 plant species with records dating as far back as 1911 and up to December, 2006. Records include invasive plants in Arizona, eastern California, Colorado, New Mexico, and Utah. SWEMP07 is available through the Southwest Exotic Plant Information Clearinghouse (http://sbsc.wr.usgs.gov/research/projects/swepic/swepic.asp, click SWEMP). Not all invasive plants are non-native and not all invasive plants are even invasive. The Arizona Invasive Species Advisory Council (2006) defined an invasive species as “a species that is (1) non-native to the ecosystem under consideration and, (2) whose introduction causes or is likely to cause economic or environmental harm, or harm to human health”. SWEMP uses the U.S. Department of Agriculture PLANTS database (http://plants.usda.gov/) to determine if a plant is native or not to Arizona. As SWEMP does not independently assess the current or potential impact of invasive plants, we include most non-native plant records contributed. We have not included agricultural crops that are non-native, for example apples, oranges, etc. 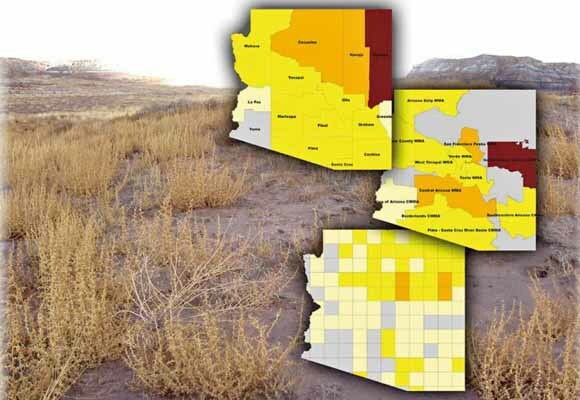 In this open-file-report, we use the SWEMP07 update to summarize the occurrence of invasive plants in Arizona and present distribution maps for a select invasive plants in Arizona. We use the word occurrence purposefully instead of the word distribution. The SWEMP07 database only provides an estimate of the actual distribution of invasive plants in Arizona. The information provided is a first approximation of the state-wide extent of invasive plant distribution. Download this report as an 85-page PDF file (of2007-1277.pdf; 4.6 MB). Note; this version contains corrected pages described in the errata sheet shown below; you do not need the errata sheet for this online version. The print version of this book was published with three errors for which an errata sheet was distributed. If you did not get one, download the errata sheet as a 1-page PDF file, print it, and insert it inside the front cover of your copy of the book (of2007-1277_errata.pdf; 64 kB).